From hedgehogs to kiwis, Yuji Naka has been involved with games that star somewhat uncommon animals and his studio Prope is getting ready for the release of its upcoming Wii game that follows a similar trend: this time, it's fish. Since leaving SEGA in 2006, Naka went on to found Prope and along with fellow ex-staff members from Sonic Team, Naka began working on new projects and put his sonic days behind him. Responsible for bringing Let's Tap to the Wii, and Ivy the Kiwi? 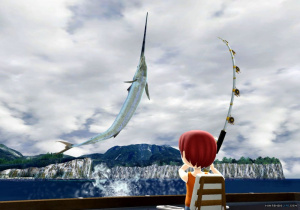 to the Wii and DS, Prope's upcoming retail release is Fishing Resort and it has been picked up by XSEED Games for localisation in North America. Known in Japan as Family Fishing, the game will allow players to fish wherever there's water. Whether it's fishing in the tropical oceans or ice fishing in the mountains, players will have the choice of reaching their choice spot by cycling or by boat. With over 20 mini-games to tackle and more than 200 varieties of fish to catch, Fishing Resort will also feature four-player competitive play and online leaderboards. Fishing Resort is scheduled for release in Japan on 4th August and in North America this Fall. XSEED Games, an independent-minded publisher, today announced a partnership with NAMCO BANDAI Games that will bring Fishing Resort, a new title themed around arcade-style fishing and recreations, to North America exclusively for Wii™. Developed by PROPE in Japan, the studio led by celebrated visionary and creator of Sonic, Yuji Naka, Fishing Resort drops players into a tropical island locale which they can explore as they see fit – this is a vacation after all! The agreement with NAMCO BANDAI Games grants XSEED Games exclusive publishing rights to Fishing Resort in North America when the game ships this fall. 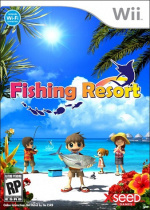 In Fishing Resort, players are put in control of their own island vacation and free to do as they please – get up early in the morning and try to grab massive fish in the deep sea, or rent a bicycle and travel to a remote lagoon. Players are free to fish wherever there is water, and a variety of locales are available, from tropical ocean fishing on the high sea to ice fishing atop the island’s mountains. With over 20 fish-related mini games and over 200 varieties of fish available – not to mention four-player competitive modes and online leaderboards, which show players how they stack up against other anglers around the world – there’s plenty of content for both casual players and completionists alike. Players start out in Fishing Resort by customizing their own unique character, and can choose to make a cartoon-style character of themselves, or someone entirely different. Add in over 200 items such as shoes, clothes, sunglasses, backpacks, hats and much more, and each player is given the tools to create an entirely unique character with which to explore the island. Fishing is accomplished by mimicking real-life fishing motions using the Wii Remote™ to cast and moving the Nunchuk™ in a circular motion to reel in fish, which range from pond guppies to massive marlins over 10-feet in length! Developed by PROPE in conjunction with NAMCO BANDAI Games and published by XSEED Games, Fishing Resort is currently in production and will be released this fall on Wii. The game will be released in Japan later this summer under the name Family Fishing. More details on Fishing Resort will be announced in the coming months. Maybe its just me but I kind of think this games pretty cool. I feel sorry for the people that dismiss this on the fact that it's a fishing game. Just take a moment to watch the video above. The game looks amazing and the fish and aquarium modes appear very well made. Definite buy for me. I almost totally dismissed this game but then I saw Yuji Naka, Prope and XSEED involved. After watching the trailer I think that it looks rather interesting. I would love to give this game a try. I was about to dismiss it until I saw XSEED's name on it. I'll keep an eye out for some reviews! Same here guys, I saw XSEED and had to watch it, and as always, this looks brilliant! Wow, the game looks beautiful! Looks kinda fun too, might pick this up sometime. I honestly don't know why XSeed would release a Wii game so late into 2011. It does look beautiful, but this is suicide. And that's coming from someone who picked up both Fragile Dreams AND Sakura Wars on the Wii (and Ys: Oath in Felghana for the also-dead PSP). That being said, I'll probably try and buy it:) It's really beautiful for one; I LOVE the "stylized realism", combining those cute, endearing characters (makes those insipid Miis look like the lazy dogsh*t they are) with realistic, gorgeous settings and wildlife. I don't give two sh**s about fishing games though. However, the RPG/Adventure component and general Aqua or Endless Ocean-esque atmosphere make me hopeful that there's more to this than literally any other stupid fishing game ever made. I also miss the days when all games seemed to take place in or around islands. Like all the platformers from the N64 and PSX days. Blue skies, clear water, fun music...those were better days. But here's hoping they keep their positive relationship with Prope going. Because I want XSeed to localize Rodea the Sky Soldier once they finish that up. Jesus christ does that game look great. Easily, the game Kid Icarus Uprising SHOULD BE. Why are there so many frikken fish simulators? Oh yeah, this looks promising and sort of relaxing. I would buy it... and Tap Runner in Let's Tap is one of my favorites. A fantastic multiplayer game. Please make Let's tap 2 Probe. Or maybe Tap Runner Ultimate.